Use LTI-WiFi to download data without access to a computer and installed software. Downloaded data is fully encrypted and automatically uploaded to a secure server. If the WiFi network is temporarily unavailable, downloaded data is stored in the LTI-WiFi’s buffer memory. The new wireless interface LTI-WiFi is a high-speed 802.11/b/g/n compatible device that connects to your WiFi network and can establish a connection to external server software via the TCP/IP protocol. The LTI-WiFi uses interface drivers that are built into all currently supported Windows OS versions, so there is no longer any need to install proprietary drivers. 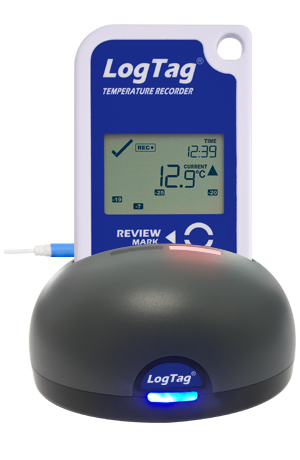 The LTI-WiFi is compatible with all standard LogTag recording products having 3 silver contact pins in the lower rear case. The LTI-WiFi uses the proven and reliable spring contact arrangement taken from the LTI/USB. The LTI-WiFi incorporates a micro USB socket for connection to a computer. Two indicators at the top (red & green) and the network LED (blue), identify what actions the interface is currently performing. 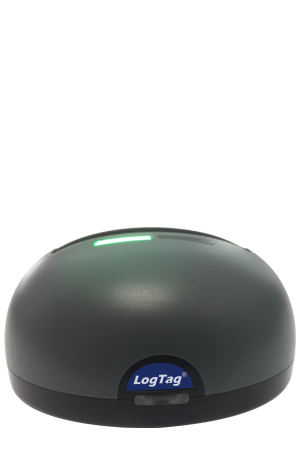 Attaching the LTI-WiFi to a power bank creates a portable data access point that will work anywhere with WiFi coverage. With WiFi access disabled, the LTI-WiFi can be connected to a computer and used as a conventional (LTI-HID) interface. Wireless Standard 2.4GHz 802.11 b/g/n. High sensitivity internal antenna.